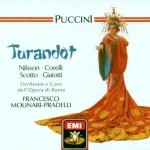 Of the “big three” most widely acclaimed Turandot recordings (the other two being Leinsdorf’s and Mehta’s), this one gives the most emphasis to the score’s raw, visceral thrills. Francesco Molinari-Pradelli has been called a decent but not outstanding conductor, and I won’t disagree, but one thing his work here doesn’t lack is excitement. The Act I finale (always a good example to cite when comparing Turandots) accelerates to a breakneck speed at the climax, creating musical chaos: it’s not pretty, it’s not elegant, but it perfectly captures the wild desperation of the moment as Calaf defies everyone. Of all the widely available recordings, this one probably comes the closest to “Turandot as verismo.” Rather than classic Puccinian lyricism, or the exotic charm and majesty of the mythical Chinese setting, the chief concern here seems to be the bloody brutality and mad passion of the story. Birgit Nilsson, in her second studio outing as Turandot, once again lives up to her magnificent reputation as the icy princess. Her piercing Wagnerian soprano has all the force, chill and grandeur of a Mount Everest avalanche, and she convinces both as a steel-hearted man-hater and in her ultimate vulnerability and surrender. The recording’s true raison d’être, however (since Nilsson’s Turandot can also be heard elsewhere), is Franco Corelli’s gripping Calaf. His tremendously powerful, darkly sensuous voice blazes through the score like a comet. Other Calafs are more elegant both musically and emotionally (it’s a matter of taste whether his verismo-tenor sobs at Liú’s death are moving or laughable), but few can equal the raw excitement he offers. As Liú, tangy-timbred Renata Scotto lacks the vocal warmth and sweetness of Caballé, Freni or Tebaldi, but her distinctive voice conveys impeccable fragility and feeling. Her rendition of the torture scene is heartbreaking, with broken, exhausted tones, followed by an almost guttural, suffering yet fiery “Piuttosto mor-ró!” Bonaldo Giaiotti sings Timur with a gravelly, ragged tone, but no shortage of anguish, while the Ping, Pang and Pong of Guido Mazzini, Franco Ricciardi and Piero de Palma are likewise a rougher-voiced trio than others, but with personality to spare. The Rome Opera Chorus offers smoother vocals than on earlier recordings like the Leinsdorf Turandot, but still with enough of a big, rugged sound to enhance the atmosphere of bloodlust and burning passion. The standard cuts to Ping, Pang and Pong’s Act II scena are in place. Once again, this isn’t a Turandot to choose if perfect beauty and elegance are your priorities. But if you favor unbridled intensity and excitement above all else, then for you, there’s probably no greater Turandot than this one. Brava…with that cast how could it be anything but wonderful? love all that burning passion and rawness! I am going to listen to this one for sure. This is wonderful stuff, Jordan – thank you. Likewise, I am with you when you say this is your second favourite Turandot after the “can-it-ever-be-beaten?” Decca Mehta (although with me, there’s also a fond look over my shoulder at the Karajan too, albeit controversially cast with two slave girls and no princess !). This EMI set is certainly red of tooth and claw, with FMP bringing out the barbarity of Ancient China very well from the pit, although I’m not wholly convinced by it as a whole. I think part of the reason for this can be laid at the feet of Franco Corelli – as you say, he certainly blazes through the part like a comet and, for me, this Prince of Tartary is a swashbuckling, testosterone-fuelled warrior! The clue can be found in his aria “Non piangere, Liu” which has none of the honeyed warmth and tenderness of Bjorling’s grateful acknowledgement to the devotion the slave girl has shown towards his deposed father, Timur (on Leinsdorf/RCA), Rather, on this occasion it is more about the final lines, “chiede colui che non sorride più” (“the one who doesn’t smile anymore”) – himself in other words. You could argue quite convincingly that since this is the climax of the aria and that these are the only lines repeated twice, therefore with an implied emphasis, that Corelli is closer to Puccini’s true intentions here … however, I’m not convinced. To my mind, Corelli isn’t Bjorling’s or Pavarotti’s “everyman” Prince, inspired by ardour to dare take on the riddles and overcome seemingly impossible odds to succeed; rather, it is the thrill of the chase, the challenge of it all that seems to inspire him. So of course, the Act II confrontation with Nilsson’s Icy Princess is like a clash of the titans – and yes it is thrilling, in its own way. 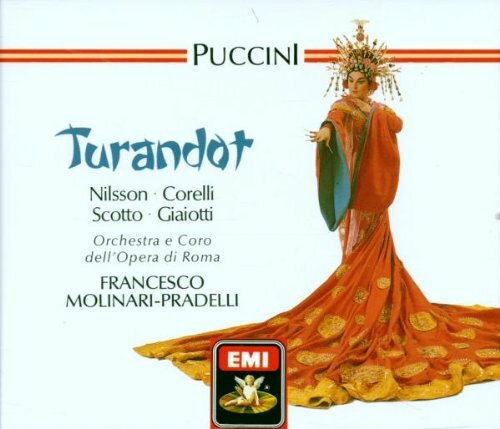 The problem though is Nilsson naturally responds to her Calafs and this vocal jousting match, so it is still happening at the end of Act III on this recording too, as if Turandot hasn’t so much been conquered by love, but rather has met her match …. I hope you don’t mind me saying then that my favourite Nilsson Turandot is the live performance from the Vienna State Opera in 1961 (now on Orfeo). Here her Calaf is di Stefano, who is somewhere between Bjorling and Corelli in interpretation, Liu is Leontyne Price, super-refulgent and scarcely believable as a frail slave-girl perhaps, but wonderfully moving otherwise, whilst Timur is Nicola Zaccaria, rightly proud and noble as a deposed King should be. Molinari Pradelli is in the pit once more, even more inspired live, not least with the Vienna PO in front of him in its opera-garb. Do you know it, Jordan ? One I bet you don’t, is from Frankfurt radio from 1957 with Georg Solti conducting (yes, that is correct – Sir Georg Solti !! 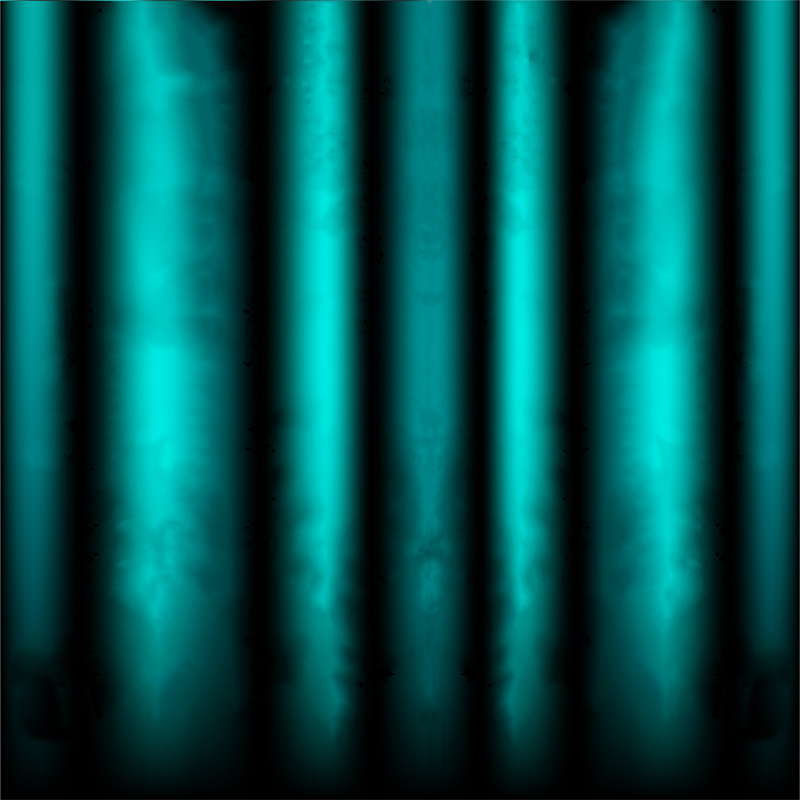 ), recently issued on Gala ?!! Although it’s sung in German, it is very good indeed and whilst the three principles of Goltz, Hopf and Stich-Randall are not the first names you would associate with these roles, they are inspired. And I know you like your DVDs (! ), so do try and seek out a performance from Orange with Roberto Alagna and Lise Lindstrom; the way they, as well as the director, perform the ending is quite wonderful, more believable than any other I have seen. There’s a short excerpt of it on Youtube here: https://www.youtube.com/watch?v=GaBk3qXbP9U – but watch out for the dragons at the end !! Thank you for sharing so much of yourself and your “Turandot” feelings with me! I’ve heard of the 1961 Vienna recording, but never actually heard it. I’ll have to look for it! I’ll also have to look for the complete Orange performance. That YouTube excerpt is excellent!